As readers may know, I like space in music. When I first saw a group of Swiss artists jam with the legendary saxophonist, John Surman, the most impressive were those who knew when to ‘shut it’, to avoid an ugly cacophony. 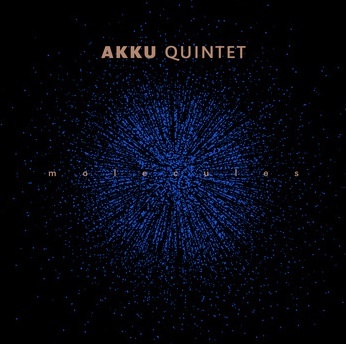 Akku Quintet share this sensitivity and aren’t afraid to step away from the mic. 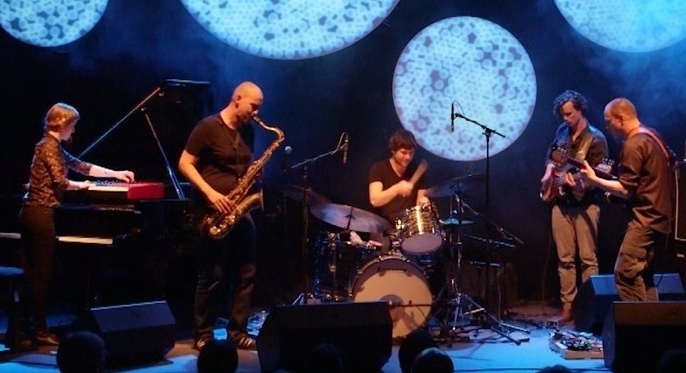 Formed by drummer, Manuel Pasquinelli in 2010, Molecules is the quintet’s second release on Pasquinelli’s own label, Morpheus. It’s an EP more than an album and my sense is they are a band in development. They carefully creep into each track, as in ‘Fluid’ and ‘Schneeman’ when Maja Nydegger’s delicate piano sets up a repetitive motif, almost acting as a mantra for the piece. This is perfectly balanced by the tenor saxophone of Thierry Lüthy who has an assured and warm tone. His notes waft around the piano melody as if the two are in a quiet conversation. When he builds to a sort of circular breathing in ‘Phase Transitions’ it brings a ripple of excitement. Despite being Pasquinelli’s project he keeps his crisp beats sparse, playing a supportive role and taking time before coming in with off beats, mini-patterns, or simple, unadorned snare and bass drums. Considering the power an electric bass can wield I was rarely aware of it, Andi Schnellmann excels at enmeshing his sound into the others’ like a soft echo of the music. The best moments come when they suddenly switch the vibe, such as in ‘Schneemann’ when six minutes in, guitarist Markus Ischer soars through with a woozy-stoned solo and Maja subtly responds with low church organ chords and pithy alien-like beeps. Markus Ischer’s guitar is the strongest voice, it resembles Lüthy’s consciousness but with extra drive. He interrupts ‘Phase Transitions’ with a warbling and affected guitar before changing his touch with metallic stabs and long haunting notes, keeping you entranced. Akku are creating soundscapes with tracks lasting 10 to 15 minutes (apart from the quirky and jaunty, ‘Freeze’), however, at times I wanted them to turn up the intensity, the music could become so laid back I became disengaged. There’s a need to develop grit and emotional vulnerability in their themes and playing. They are working with media artist Jonas Fehr for their live shows and I liked the cover artwork by Sandro Galli. Pasquinelli has invested in a limited edition of hand-printed covers for the vinyl edition but his next focus should be developing the band’s voice so it stays relevant and is not shy of demanding to be heard.